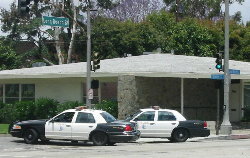 (May 20, 2002) -- Disrupting neighborhood life in upscale Bixby Knolls, robbers struck the Washington Mutual Bank branch on Atlantic Ave. at Roosevelt Road shortly before noon today. LBPD says that at roughly 11:13 a.m., one of three suspects gave a teller a note indicating he had a gun, but not brandishing the weapon. The group made off with some quantum of bank loss, although police as a matter of policy are tight lipped about exact amounts. 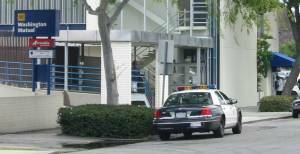 LBPD responded in force, setting up a perimeter that encompassed part of the nearby Los Cerritos neighborhood. 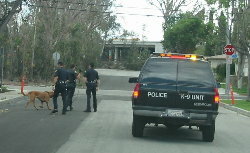 A command post was established on Pacific Ave. south of 36th St. near the 405 freeway. At one point, a canine officer was brought in to scour the area, and using suspect descriptions and quick footwork, LBPD officers succeeded in apprehending two of three suspects who are in custody tonight. Police say they also recovered the bank loss and located a handgun and other evidence. All photos on this page courtesy of citizen photojournalist Bill Lovelace.